"Barossa is a tour de force of straight harmonic writing, primed to keep the brow creased, and the heart pounding. 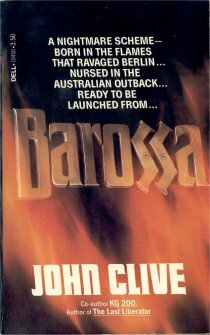 Clive's style is distinguished by a zesty delight in yarn spinning that harks back to the masters of an earlier era"
"Good, strong stuff, very powerfully written, you'll enjoy it..."
"John Clive's supense novel Barossa is a highly exciting tale of nuclear menace..."
Judson Hand, NEW YORK DAILY NEWS. "A journal of entertainment...a climatic confrontation both inventive and unforgettable." "Mr Clives real success is in developing his initially repulsive hero into a character of some depth." "A run for your life suspense story that races all the way to the final page..."
"A cracking adventure thriller...fresh and inventive style. JOHN CLIVE has built himself a growing audience for his cleverly planned thrillers." "His career is blossoming with the impact of an atomic mushroom cloud...the ending is a scoop of scoops..."
"Barossa ends with an unexpected twist after maintaining interest throughout. Its a fair dinkum read..."
James E Alexander, PITSBURGH POST-GAZETTE.